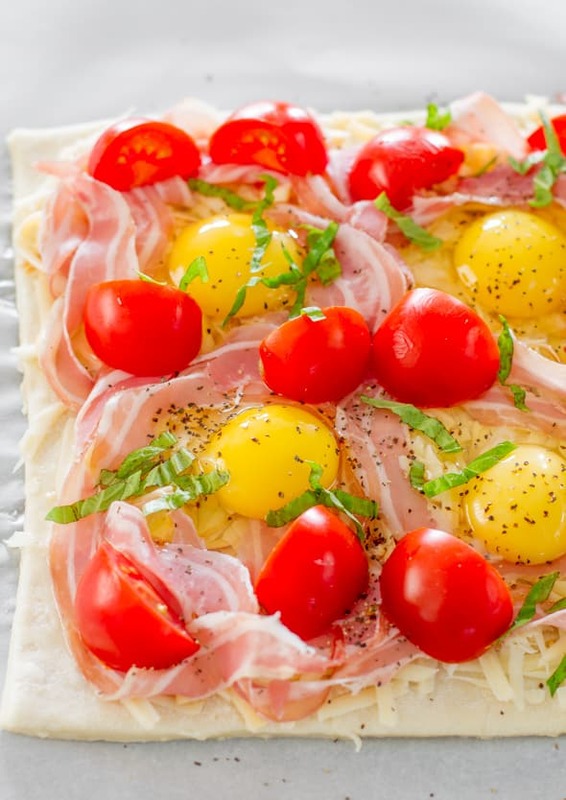 Pancetta and Gruyere Breakfast Pizza – simplicity at its best. 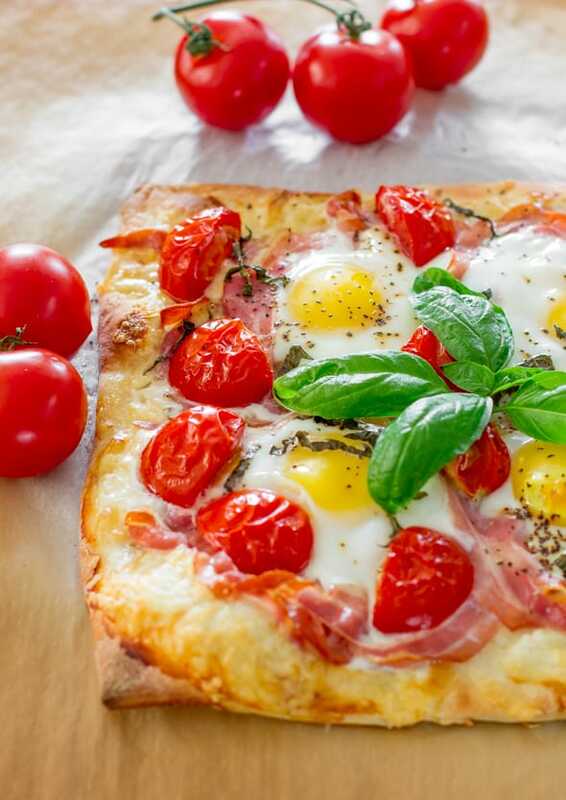 Simple ingredients create this wonderful and delicious breakfast pizza. As I sit here to write this post and look at these pizza pictures I remember the first time I ever had pizza. I was about 11 or 12 years old at a restaurant in Timisoara with my family. This was when Romania used to be communist and foods like this were not common. Eating at restaurants was not a common thing for us. Back then we had rations on oil and sugar, so it was not often my mom would indulge in baking. Baking was for special occasions like the holidays. But that day was a summer day and one thing I miss about my old country are the restaurant patios and the people. People everywhere. People walking to work, going for a stroll or visiting with friends and family. On that day we all sat outside on the patio and my father ordered pizza for all of us. I remember we all got individual deep dish pizzas. I was curious because I had never had pizza before but had heard so much about it. On that day I fell in love with pizza. Needless to say that since that day I’ve had and tried many pizzas. I have to say that in Windsor, Ontario where I lived for almost 25 years you find some of the best pizzas in the world. I miss those authentic little Italian pizza shops. Every time I go back there, one of the first things I do is order pizza from my favorite pizza place. And since I cannot find my favorite pizzas here in Calgary, hubs and I learned to make our own and since then we’ve never ordered pizza again. One of our favorite pizzas that we make quite often is breakfast pizzas. We’ve tried different variations and today I’m sharing with you my latest creation with pancetta, Gruyere cheese, eggs and tomatoes. And what a wonderful creation it is. Gruyere cheese is a type of Swiss cheese that’s rich and creamy and has a slight nutty taste. And Pancetta, well here I come to my first love again, Pancetta is an Italian bacon sliced very very thin. The beauty about this pizza is its simplicity. When I think of how Italians used to cook long ago this is how I imagine it. Simple and beautiful ingredients. Preheat oven to 500 F degrees. Line a baking sheet with parchment paper. Maybe I’m missing something, but where is the recipe for the pizza dough? Made this for brunch last weekend and it was a hit….sooooo good! Only change I made was chiffonading the basil and scattering it all over the pizza. Can’t wait to make it again. Thanks!! You’re welcome Emma, glad you liked it. just made it with phyllo dough instead & was soooooo yumilicious! thx for the recipe– the pic made the sale! You would have been amused at my facial expression in regard to your post. I read the title, but my eyes popped when I saw the sunny side up eggs. Wow the yellow of the egg and the red of the tomatoes lights up the soul. I have never had a breakfast pizza. My story is not as colorful as yours, but pizza is one of those foods that I clearly remember the first time I had one. It was a rectangle one too. Hi Carol! I wanted my eggs to be a bit runny because the last time I had made breakfast pizza I cooked it too much, so this one was just perfect. YUMMY! This looks amazing! I like all your recipes. Thanks for sharing your kitchen adventures. This may be one of the most beautiful pizzas I have ever seen. 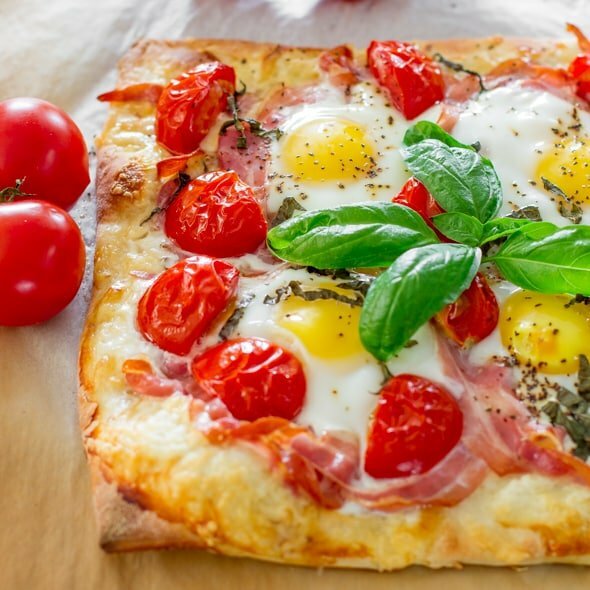 I love breakfast pizzas, and I can’t wait to try this recipe! Pinned!